Since the beginning of July, RadioShack has opened 10 “concept” shops aimed at highlighting various electronic products in new and innovative ways. According to POPAI, they are showing no signs of slowing down either. It is exciting at least one of their stores has a completely different feel, the one that opened yesterday. But the concept started so RadioShack could bring in more money. They’re focusing on interactive displays so customers can test out the product and have a great in-store shopping experience. RadioShack has stated in press releases that they plan on opening at least 100 of these “concept” stores by the end of the year. The design will then spread throughout all their remaining stores. The concept store that is different from the others just opened yesterday (October 20,2013) in Fort Worth, Texas. RadioShack decided to tailor their hometown’s store to have a mid-century retro feel. The location is in the Commerce Building in Sundance Square and it will have location-specific features such as a brand evolution banner on the outside of the stores with their logos from 1921 to the present, custom uniforms for employees, interactive projections, and screens with the history of RadioShack. OfficeMax is bringing a new retail brick-and-mortar concept store to the Chicago area. According to Chain Store Age, the new business solution concept store will occupy almost 4,000 square feet in Chicago’s Streeterville neighbordhood. Special services for business customers will include enhanced technology support, marketing, document and shipping services, and expert associates. Macy’s is putting high priority on Generation Y with the retailer’s implementation of its Millennial initiative. According to an announcement from the store, Macy’s will roll out more than 20 brands for its Macy’s mstylelab (primarily serving customers ages 13 to 22) and Impulse (primarily serving customers ages 19 to 30) departments. Announced in spring 2012 with an internal restructure to focus on this customer and a plan to be implemented in progressive stages, Macy’s Millennial strategy aims to position the retailer to attract and retain customers in the Millennial generation — now America’s largest and most diverse age demographic with spending estimated at $65 billion each year for the kinds of merchandise sold at Macy’s, the announcement said. Macy’s is using its research into the preferences of Millennial-generation customers to plan its assortments for men and women in this age group. These preferences are rooted in lifestyles that influence how Millennials express themselves, primarily along the spectrum of their interests in fashion and culture. The research will also be used internally by Macy’s to shape marketing, store environments and visual presentation in mstylelab and Impulse, the announcement said. Last week, we published a story on Starbucks’s first modular store in Colorado—a LEED-certified drive-thru and walk-up shop clad in reused snow fencing. The small, glowing beacon to sustainability is part of the coffee giant’s strategy to build small outlets in markets that can’t necessarily support sprawling retail spaces. Recently, Starbucks extended the idea to Tokyo, where Nendo, a local design firm, built a pop-up that dispenses with the brand’s signature lounge-y living-room feel for an austere library, stocked with books and a few hard chairs. Where are the dark-green walls, pendant lighting, and communal tables? Gone, gone, and gone. The only recognizable remnant of the brand is the mermaid logo peeking out of a tiny ordering window at the back of the store. That’s a radical departure for the company, which has previously been partial to in-your-face branding. 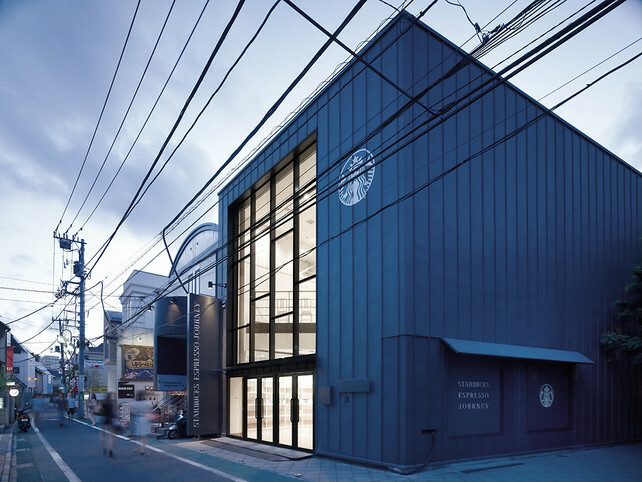 The idea, according to Nendo, was to create a library, where customers could learn about coffee from the nine different books lining the shelves, each of which is a primer on the Starbucks espresso drinks on offer. Each color of book corresponds to a different espresso drink. Visitors can stroll around the space, freely pulling books off the shelves to read and choose the drink that best suits them. At the counter, visitors can trade the book for an actual espresso drink but retain the book cover [that] tells them about the drink they have chosen, to use as a book cover, as they like. An online grocery delivery service is launching “virtual grocery stores” at commuter rail stations across the country. Peapod.com, owned by the U.S. subsidiary of Dutch supermarket operator Royal Ahold, announced it would launch more than 100 of the virtual grocery stores at commuter rail stations in Boston, New York, Philadelphia, Washington, Chicago, New Jersey and Connecticut. Commuters in the markets Peapod serves spend an hour in transit to and from work each day, according to Census data. The “stores” consist of billboards that allow commuters with iPhones, iPads and Android phones to scan a QR code, download an app and start shopping by scanning bar codes on the products. Peapod has made deals with Barilla, Coca-Cola, Kimberly Clark, Proctor & Gamble and Reckitt Benckiser as part of the new initiative. The initiative is a larger rollout of virtual grocery stores that Peapod has gradually unveiled at commuter and rapid transit rail stations in places like Chicago and Philadelphia.